Email needs no introduction in 2017. It’s the most used (dare we say exploited) medium to communicate, engage and retain customers. There are different types of emails (some more effective than others) that brands today send – marketing, offers, deals, promotional, newsletter, transactional, triggered, etc. A simple search on the internet will throw up different numbers for types of emails. No number is more right (or wrong) than the other. But to put things simply and in less confusing way, this whole gamut of emails that brands send out can be broadly classified into 3 – Transactional, Triggered and Marketing. Best practice for sending emails is – 80% emails of the first types and only 20% of marketing emails. 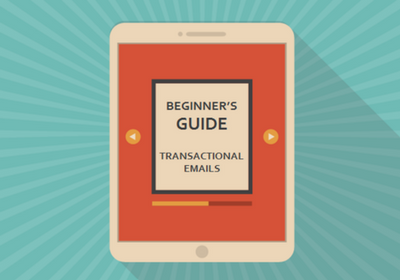 This blog is for beginners in transactional emails and aims at covering fundamentals you need to know before you start sending transactional emails. Let’s for a minute not go by the definition. Consider emails from Amazon and Uber – some of the top guys that regularly send emails. An email from Uber when your trip ends is a transactional email. Invoice email when you buy from Amazon is transactional. Did you notice anything common in these emails? They all are coming to you based on your own actions. All are important and re-confirms your act. Simply put, transactional emails are emails sent basis action taken by users like – signup, purchase, password reset, etc. What is the difference between transactional, triggered and marketing emails? Why not in-house system for sending transactional emails? If it weren’t for the volumes or the concerns about emails landing in Spam, your in-house system would have more than sufficed. But it isn’t so. So opting for a transcational email service is more of a need than choice. We send a lot of transactional emails and there’s no way they can land in Spam. If this is you, what you need is a good application that you can integrate your system with and start sending emails. What’s more, most of these applications also throw in some additional features like email building templates. So you don’t just inbox emails at scale, you also get to send good looking emails to your customers. How to choose the right transactional email service? Does the ESP send transactional emails exclusively? A quick look at what users are saying (reviews from trusted sources) might also help you in your decision-making process. How to set up my transactional emails? STEP 1: Set up your DNS – The first step in setting up your transactional emails is to set up a domain from which you will send emails to your customers. One should carefully select this domain. It is recommended to select sub-domain of the main domain to send these emails and also ensure no marketing or triggered emails are sent from this domain, especially if your monthly email volumes are in millions. Once you have the right domain ensure it is authenticated via SPF, DKIM, and DMARC. DMARC: Domain based message authentication, reporting and conformance are another validation that detects and prevents email spoofing. It reports any fraudulent email sent from your domain. This is very critical for transactional emails.